Bass player, composer, he studied classical guitar, acoustic bass and contemporary composition. 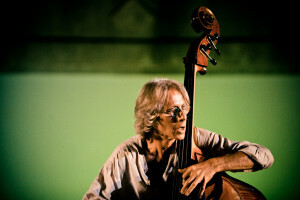 Paolino Dalla Porta is considered one of the most interesting and eclectic bassists of the Italian and European jazz scene. Since its inception in the late 70’s, he has always tried to combine various musical languages that merged improvised and creative music, Mediterranean and ethnic traditions and Jazz. In over thirty years he has been the promoter and collaborator of many groups that thanks to the research of music and original languages have contributed to the creation of what was defined as a real current of Italian and European Jazz: Nexus, Democratic Orchestra Milano, Stefano Battaglia Trio, Enrico Rava 4tet, Maurizio Giammarco Trio, Elena Ledda, Antonello Salis 5tet, Grande Orchestra Nazionale, Bebo Ferra – Paolino Dalla Porta Duo, Gianluca Petrella Indigo 4tet, Paolo Fresu Devil 4tet, Tino Tracanna Acrobats 5tet, Giovanni Falzone Special Band etc. Since 1978 he has been playing and recording with many prestigious European and American musicians, among which: Pat Metheny, Dave Liebman, Lester Bowie, Sam Rivers, Aldo Romano, Tony Oxley, Paul Bley, Kenny Wheeler, Mick Goodrick, Adam Nussbaum , Lee Konitz, Paul McCandless, Michel Pertucciani, Billy Cobham, Mal Waldrom, Leroy Jenkins, Glenn Ferris, Massimo Urbani, Don Cherry, Oliver Lake, Franco D’Andrea, Ran Blake, Jimmy Owens, Daniel Humair, Don Moye, Manfred Schoof, Roberto Gatto, Misha Mangelberg, Han Bennik, Bill Elgart, Richard Galliano, Francis Bebey, Dominique Pifarely, Claudio Fasoli, Kurt Rosenwinkel, David Murray, Dave Burrel, Sainkho Namtchylak, John Taylor, Eliot Zigmund, Roswell Rudd, Norma Winstone, Dave Binney, Nelson Veras, John Tchicai, Bill Stewart, Mark Turner, George Garzone, Uri Caine, Bill Carrothers, Steven Bernstein, Jeff Ballard, Avishai Cohen, Jorge Rossi, John Abercrombie, Don Byron, Nir Felder and others. Tours in all Europe, United States, Australia, New Caledonie, French Polinesia, Argentina, Africa, China and Colombia. International Jazz festivals: Chicago, Melbourne, Atlanta, Umbria Jazz, North Sea Jazz Fest, Marciac, Pisa, Grenoble, Wien, Koln, Zurich, Rive de Geres, Le Mans, Cagliari, Montpellier, Clusone, Maastricht, Ravenna, Calvì, Genova, Nevers, Trento, Maribor, Arnhem, Verona, Bolzano, Chur, Zagreb, Hamburg, Vicenza, Milano, Skopje, Paris, Venice, Porquerolles, Boulogne S.M., Berchidda, Roccella Jonica, Vitrolles, Glasgow, Womex-Berlin, Buenos Aires, Bogotà, Montevideo, Jerusalem, Gent, Coutances, Roma, Leverkusen, Guimaraes, Beograd, Bucarest and many others. Paolino has recorded about 150 records among which six as leader and twenty as co-author. In 1994, his record “Tales” with Kenny Wheeler was awarded four stars by the prestigious American jazz magazine “Down Beat”. He also composed the sound tracks of the movie “Domenica”, directed by Wilma Labate, the music for the docu-movie “Inge” by Luca Scarzella and the music for “Magia d’Africa” by Achille Mauri, a tv documentary . He has been teaching Master Classes at Siena Jazz Summer Workshop since 1999. He is a Bass Professor since 2006 at the Jazz Department of Milano Conservatorio and at the Piacenza Conservatorio since 2014. Currently he is member of the Bands: Oregon, Paolo Fresu (Devil Quartet – Kind of Porgy & Bess Sextet), Zlatko Kaucic Trio, Tino Tracanna Acrobats Quintet, Duo & Trio with Bebo Ferra, Duo with Giovanni Falzone, Dino Rubino Trio and he is a leader of different projects (solo, trio, quartet, quintet). He has been elected Best Italian Bass Player in 2008 in the magazine InSound and also in the Top Jazz 2009 by the magazine Musica Jazz.